It’s a common situation: a high-importance analysis comes into the lab or you’re called on to manage a project that’s crucial to your company’s success. Yet the biggest problem isn’t the project; it’s working around personality conflicts, miscommunications, and inefficiencies that occur within the team. This frustrating, counterproductive experience is only complicated by the recession, which is forcing everyone to do more with less. However, by learning to respond to observable data, you can improve your ability to get commitment from others, increase your value in any group situation, and free up your workplace "bandwidth" to focus on the issues, not the people. Like your manufacturing and development processes, human interactions are driven by two knowable and measurable factors: behavior and motivation. Behavior is the observable data you can use to immediately make corrections in any human interaction. Behavior is easy to read when you know what to look for. Visible behaviors impart a tremendous amount of knowledge regarding those with whom we work. Whether you’re selling, influencing, coaching, leading, or trying to chart your own career development, an operational knowledge of behavioral factors and appropriate responses is crucial to success. Motivation is the set of hidden drivers behind people’s actions that give you clarity about why people do what they do. Our ability to understand it directly influences our persuasive skills and our capacity to lead or manage others. Many of us struggle to understand what motivates ourselves; it is no wonder that we have a hard time understanding the motivation of others. And yet, like behavior, motivation is measurable; it need not be nebulous or abstract. In combination, the two models give you a powerful set of analytical tools to take the "noise" out of your workplace interactions - and get back to business. Yet how can you begin to utilize these important tools to solve, or better yet, avoid team problems altogether? Semitracks' brand new one-day Troubleshooting Human Interactions course will equip you to do just that. This is not a "soft skills" class. It’s an analytical approach to human interaction, presented by an engineer for engineers, technical professionals, supervisors, and managers at all levels. The instructor is an award winning author and an expert in the application of analytical models to human productivity. Discover how you can revolutionize your human interactions today! "Incredibly enlightening. I have never thought of my work relationships in this way." "The lessons you taught will serve us for the rest of our careers." "Things that have concerned me in my teen years and as an adult were answered." Acoustic microscopy must be addressed within the context of X-Y resolution and Z resolution. In this technical tidbit, we’ll discuss X-Y resolution. X-Y resolution requires a mathematical approach. The detectability is determined by size of the acoustic beam, which depends on many variables such as the speed of sound in the material inspected. Frequently these variables are unknown and not easily measured. However, approximations can be useful. The beam diameter can be approximated by the equation shown in Figure 1, where FL is the focal length, C is the velocity of sound in the material, f is the frequency of the transducer, and D is the diameter of the piezoelectric transducer. Figure 1, Equation approximating detectability (top) and model of the acoustic microscopy transducer (bottom). Higher frequency transducers provide better detectability. Figure 2 shows three images of the identical area of a flip chip. The top images show the best resolution. However, the consequence of using higher frequencies is a lack of penetration through the material. 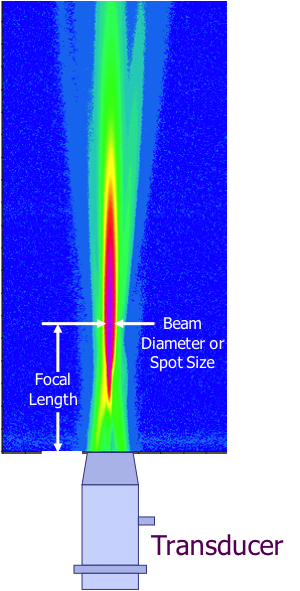 Only very dense and thin materials such as metals can be imaged using ultra-high frequencies. Notice how the defect is almost unnoticeable in the 75Mhz image. The solder ball noted by the blue arrow cannot be easily seen in either of the other two images. Figure 2, Three images showing the same area on a flip chip. All images were provided courtesy of Sonix Inc.
Q: Would IDDQ help identify "weak" wire bonding? We have undetectable micro-cracks in our bonding that starts normally (e.g. part passes) but fails after temperature cycling. Do you have any ideas on how we might non-destructively & quickly test them to screen out the weak or "walking wounded" ones? I don't think TDR would be sensitive to this reliability problem (at least until the crack gets large). A: It is possible that the Neocera Magma SQUID tool can detect weak wire bonds. The SQUID tool uses a sensitive high temperature superconductor detector to examine low level magnetic fields non-destructively. When the current necks down to a small region to get by a crack in a PCB, the current narrowing causes a dipole moment in the SQUID image which is visible. It's possible the same thing could happen with a bond wire. Good luck!